The Peacock Table Lamp is an elegant and sleek piece inspired by the bird’s feathers. Shade included. This sculptural piece is available in cream shagreen with bronze-patina brass or black pen shell bronze-patina brass. Custom color/sizing available on request. The finish of the shagreen is authentic as it is hand-dyed and the designer calls the finish look: "antique natural shagreen." The dimensions of this piece are 24 x 24 x 93 cm / 8" x 8" x 36.5" All R&Y Augousti pieces are handmade by artisans, ultimately making each piece unique. Wipe clean with soft dry cloth. Acclaimed design duo Ria & Yiouri Augousti have established themselves since the 1990’s as pioneers of modern-vintage style through their luxurious art-deco inspired collections. The Paris based label has distinguished themselves since their launch, with their iconic use of shagreen mixed with brass and other exotic materials. All furniture is handcrafted by skilled artisans, ultimately making each piece unique. All shagreen-covered items should be kept out of direct sunlight, color variants may occur on the stingray and other exotic finishes, but this showcases the Parisian label's commitment to creating authentic luxurious products using natural components. R&Y Augousti was founded in 1989 by husband-wife duo Ria & Yiouri Augousti. Their artistic backgrounds brought them together as innovators in their field by reviving the artisanal techniques of shagreen and other exotic materials that were predominant in the Art Deco period of the 1930s. Through their mix of vintage and contemporary design their furniture and home accessories brand were met with worldwide praise. From a debut collection for the luxurious Hotel Crillon in Paris, to exclusive collections for luxury stores like Barneys New York & Bergdorf Goodman, they finally opened their flagship store on the famous Rue Du Bac in 7th arrondissement of Paris, France. From this they began to work closely with worldwide famous interior designers, architects and celebrities to create custom pieces for their homes and projects all within keeping to the Augousti universe. Although shagreen is their signature DNA, R&Y Augousti are known as pioneers of pattern mixes of exotic materials of shagreen, shell, parchment, eel-skin, semi-precious stones, snakeskins and metal. Their stunning patterns are identifiable by their worldwide clientele. Continuing and honoring the heritage of Augousti, their daughter recently opened a showroom in New York called KIFU PARIS, that carries the R&Y Augousti collection, her fiancée’s sculptural candle collection- Patrick Coard Paris-, and her own furniture and home accessories. Beautiful peacock from the 1960s with brass stem. Continental first quarter of the 20th century bronze peacock base table lamp with colored glass plume and black switch (signed Made in Czechoslovakia). Brass lotus lamp in Verdigris patina. Lamp shade shown (not included) is 18" diameter by 8.5" high. 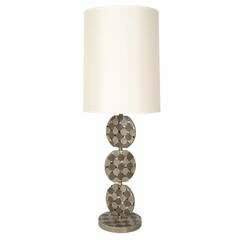 A salmon colored table lamp clad in bookmatched shagreen, with nickel hardware. French, circa 1940 18” H 12” W 7” D 9” H 7.75” W 2.75” D.